Russell responded to Parts 3a and 3b, so it's time for another installment in our debate. His comments have caused me to think very deeply about the Mass and the particulars of the profound and abiding mystery that is unfolding whenever the Mass is celebrated. I am very thankful for that, but I also fear that I am running out of ways to explain it. Once I begin having to repeat myself, that's a good indication that a debate has reached a stalemate, and I fear that's where this debate is headed. But do not despair! I think there is some good stuff here, and I hope you will stick with me as I continue to make the case for a ministerial priesthood within the New Covenant People of God. If you are just now joining me, you should know that this debate has shifted it's focus onto the Sacrifice of the Mass. I am usually a stickler for staying on topic, but I have allowed this shift and even contributed to it because I think that what the priest does in the Mass is at the very core of his identity as a priest. If there is no actual sacrifice being offered in the Mass, then the whole notion of "ministerial priest" in the Church needs to be re-examined and potentially discarded altogether. However, if the Mass is sacrificial, then the ministerial priest is an important and even necessary component of the makeup of the Church and the spiritual lives of Christians. Also see Parts One and Two. His words will be indented and italicized. First of all, you are ASSUMING that Jesus’ sacrifice is somehow “perpetually offered” to the Father. But the book of Hebrews NEVER says that, nor is it found anywhere else in Scripture. John said, "I saw a lamb standing as though it had been slain" (Rev 5:6; cf. 14:1). Jesus is depicted as a lamb 28 times in the Book of Revelation. Why would Jesus still appear in heaven as a Passover lamb if He did not continually offer His sacrifice to the Father for us? God desires that from the rising of the sun to its setting a pure offering be made (cf. Mal 1:11). How is this fulfilled but by the Eucharist? In Lk 22:19 (cf. 1 Cor 11:24) poieo is in the present tense. The present tense usually denotes a continuous kind of action. It can also be used to describe something some one does habitually. Robertson's Word Pictures of the New Testament says that "This do" (τουτο ποιειτε) indicates repetition, as if Jesus said, "keep on doing this." David said the todah (thanksgiving offering) was to be offered continually, and the Eucharist is the new todah meal. Psa 50:12-14 echoes the opinion of the Jewish midrash that when the Messiah comes, all offerings will be abolished except the thanksgiving todah offering. It will continue. Jesus is "ministering now in the sanctuary" (Heb 8:2), He has entered the sanctuary of heaven "now to appear in the presence of God on our behalf" (Heb 9:24). The High Priest enters the sanctuary to offer sacrifice, and the author says that he is presently ministering in there. What do you make of all this? First of all, that the Mass is truly sacrificial and of spiritual benefit does not contradict the distinction that I made. My very next sentence explains why: "We don't have multiple offerings, we have one offering without end, and every time the Mass is celebrated this offering is made present and it's merits applied to us." Since the sacrifice made present in the Mass is the sacrifice of Christ, the Church is obviously going to believe that the Mass is a truly propitiatory sacrament of redemption. Heb 10:11-18 And every priest stands daily at his service, offering repeatedly the same sacrifices, which can never take away sins. 12 But when Christ[a] had offered for all time a single sacrifice for sins, he sat down at the right hand of God, 13 then to wait until his enemies should be made a stool for his feet. 14 For by a single offering he has perfected for all time those who are sanctified. 15 And the Holy Spirit also bears witness to us; for after saying,16 “This is the covenant that I will make with them after those days, says the Lord: I will put my laws on their hearts, and write them on their minds,”17 then he adds, “I will remember their sins and their misdeeds no more.” 18 Where there is forgiveness of these, there is no longer any offering for sin. In this passage, the author is continuing his series of proofs for the superiority of Christ's sacrifice over the sacrifices of the Old Covenant. In vs. 18, he is basically saying that the sin offerings of the Old Covenant have been replaced by Christ's single sacrifice for sins and the forgiveness it brings. This has no bearing upon the Mass because the Mass IS the single sacrifice offered for all time from vs. 12. You are taking vs. 18 out of context if you think it refers to anything other than the Old Covenant sacrificial system. Whenever terms like “forever” or “continual” are used in the book of Hebrews, they are addressing other things, like Jesus’ throne (1:8), His priesthood (5:6, 6:20; 7:17, 21, 28), the priesthood of Melchizedek (7:3), the perfection of believers (10:14), and Jesus Himself (7:24; 13:8). But this book (which deals extensively with sacrifices and offerings) never refers to Christ’s offering, itself, as “continual,” “perpetual,” “forever,” etc. So this concept is simply (and wrongly) read into the text. Once you realize that the purpose of entering the sanctuary is to make an offering for sin, then verses like Heb 8:2 and 9:24 (which I referenced above) are clear indications that Jesus' offering is continual, perpetual, forever. It's happening "now". It is in fact "for all time", as we read twice in the passage I provided. In this special case concerning Jesus, His perpetual priesthood does NOT require a perpetual sacrifice, because His offering is a sufficient and FINISHED work. How do we know this? Because He is SEATED at the right hand of the Father. Notice that the Old Testament priests were STANDING to offer sacrifices (Hebrews 10:11). They continually stood because their offering was never finished. But Jesus, after He offered Himself as a Sacrifice, SAT DOWN at the right hand of the Father (Hebrews 1:3; 10:12). This signifies that His work of redemption was done; it was completed; it was the END of His sacrificing. There was no more sacrificing (offering for sin) to do after this (Hebrews 10:18). The debt was paid. Heb 1:3-4 He reflects the glory of God and bears the very stamp of his nature, upholding the universe by his word of power. When he had made purification for sins, he sat down at the right hand of the Majesty on high, 4 having become as much superior to angels as the name he has obtained is more excellent than theirs. To sit at the right hand of the Father is to assume the position of superiority over angels (cf. Heb 1:14) and enemies (cf. Heb 10:12-13), the position "far above all rule and authority and power and dominion, and above every name that is named" (Eph 1:20-21). To sit at the right hand is to be exalted (cf. Acts 2:33; 5:31). Jesus is "the Son of Man sitting at the right hand of power" (Mt 26:64), that is "the power of God" (Lk 22:69). Ultimately, by His sitting, Jesus has assumed the position of one who is equal with the Father. Rom 8:34 who is to condemn? Is it Christ Jesus, who died, yes, who was raised from the dead, who is at the right hand of God, who indeed intercedes for us? Heb 8:1-3 Now the point in what we are saying is this: we have such a high priest, one who is seated at the right hand of the throne of the Majesty in heaven, 2 a minister in the sanctuary and the true tent which is set up not by man but by the Lord. 3 For every high priest is appointed to offer gifts and sacrifices; hence it is necessary for this priest also to have something to offer. Jesus doesn't even remain seated. Stephen "gazed into heaven and saw the glory of God, and Jesus standing at the right hand of God" (Acts 7:55). John saw "a lamb standing as though it had been slain" (Rev 5:6; cf. 14:1). These passages reveal that His priestly ministry (which, as we will see, includes the offering of Himself) is part and parcel with His sitting at the right hand of the Father. But how does He intercede? It is by "ministering in the sanctuary" (Heb 8:2). Christ offers His body (cf. Heb 10:10) and His blood (cf. Heb 9:12-14) as an atonement sacrifice in the sanctuary of heaven (cf. 9:24). "Christ has entered ... into heaven itself, now to appear in the presence of God on our behalf ... to put away sin by the sacrifice of himself" (Heb 9:24-26). Did you get that? He is in heaven, now, offering the sacrifice of Himself! I don't see how it gets much clearer than that. Calvary is payment for a debt. The payment of a debt is not “never-ending” if it has been paid in full. There is no need to keep paying (or keep “offering” payment) for it. Are you possibly saying that Jesus’ work on the cross did NOT fully pay the debt for our sins? Hopefully, you don’t believe this. Then for what reason would it need to be “re-offered” or “re-presented” to the Father? Do His words, “It is finished” mean nothing? The context of this “once for all” language in Hebrews points to an ending / a finish / a halting of the sacrifice / offering, NOT a continuation. The Protestant understanding of "It is finished" is probably the greatest instance of eisegesis that I have ever encountered. That is not what Jesus meant when He said, "It is finished." His words have nothing to do with the full payment of a debt. You are reading that into the text. When He said this, He had yet to die, nor had He risen from the dead or ascended to the right hand. These are crucial aspects of Jesus' redemptive work! (cf. Rom 4:25; Eph 1:18-20; 1 Pet 3:21-22; etc.). This can only mean that His work of redemption was not in fact finished. Jn 19:28-30 After this Jesus, knowing that all was now finished, said to fulfill the scripture, “I thirst.” 29 A bowl full of vinegar stood there; so they put a sponge full of the vinegar on hyssop and held it to his mouth. 30 When Jesus had received the vinegar, he said, “It is finished (τετέλεσται, tetelestai)”; and he bowed his head and gave up his spirit. Lk 18:31 And taking the twelve, he said to them, “Behold, we are going up to Jerusalem, and everything that is written of the Son of man by the prophets will be accomplished (τελεσθήσεται, telesthesetai). Or, as the NIV has it, "will be fulfilled". The Gk word here and the one for "finished" in Jn 19:31 share the same base word. Jesus went to Jerusalem to fulfill what was written of the Son of man by the prophets. And when He finally drank from the sponge on the hyssop branch, that was mission accomplished. The prophecies were fulfilled. That's what Jesus meant. You can look back at Calvary and be (perpetually) thankful for it, or maybe (perpetually) remember it or (perpetually) commemorate it with a ritual… but the payment for our sins (or its offering to the Father) is not perpetual, since it is a finished work. Russell, Jesus is securing an eternal redemption with His own blood in the Holy Place, in the heavenly sanctuary (cf. Heb 9:12), where he resides "for all time" (Heb 10:12, 14). It all seems very obvious to me that the Letter to the Hebrews affirms what I've been defending. I don't really know what else to say. This seems to be what you are saying, but this wouldn’t make sense. What is the point of the CONTRAST in Hebrews 7:27 if they are BOTH continual? If it is indeed a “continual” sacrifice, then Jesus would have to be in a continual state of death! The sacrifices of the Old Covenant are not continual in the same way that Jesus' sacrifice is continual. I already addressed this in Part 3b when I explained what "once for all" meant, but I'll give it another go. The sacrifices of the Old Covenant were continual in the sense that the high priest was always going into the sanctuary, sacrificing an animal, then going out. In and out, in and out, each time sacrificing a different animal. Jesus' sacrifice is continual in the sense that, when He enters the sanctuary, He does not leave. He stays there and offers the single sacrifice of Himself, to the Father, forever. This is also why He does not in fact "have to be in a continual state of death." He entered the heavenly sanctuary through His death, and since He does not leave it, it is not necessary for Him to die again (cf. Heb 9:25-26). 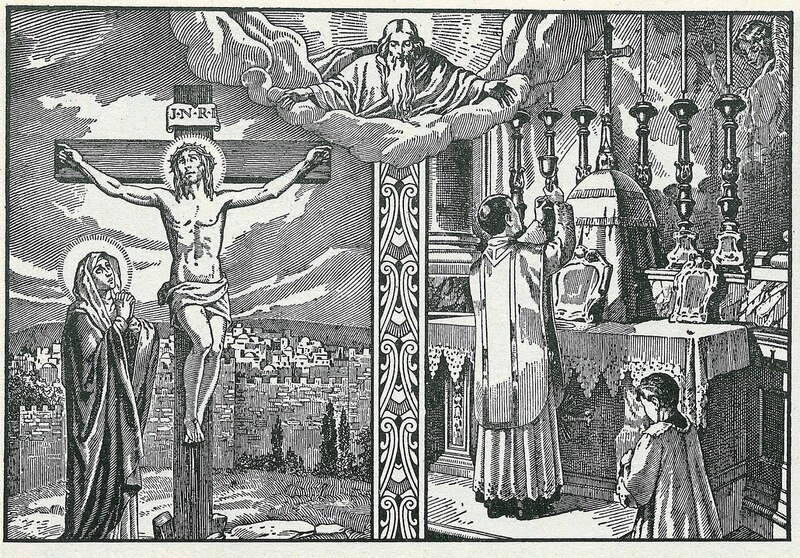 Within the context of the Mass, Jesus' sacrifice is continual because the Mass is celebrated every day. From the rising of the sun to its setting and in every place a pure offering is made (cf. Mal 1:11). Every day Catholics all over the world come together to witness this perpetual offering and to receive the spiritual benefits of it. Surely you can see how the "continual" nature of the two kinds of sacrifices is not the same. The Old Testament priests (plural) with the new Testament High Priest (singular): As I understand it, the contrast in Hebrews is not between priests and the High Priest, but between OT high priest and NT high priest. At any rate, the contrast as you present it is only damning of the Catholic position if the letter precludes a ministerial priesthood ... but you haven't proven that yet. The Old Testament offerings with the New Testament's "no more offering": You are misinterpreting Heb 10:18, as I've already shown. "No more offering" does not apply to the Mass. The Old Testament continual sacrifices with the one sacrifice of Jesus: See above. Notice several things in these verses. First, the blood of the Old Covenant sacrifices was required to make everything ceremonially clean (cf. Heb 9:13); and such shedding and sprinkling of blood on the people cleansed them and obtained forgiveness for their sins. Thus, Leviticus 5:9-10; 16:30 [. . .] We have learned previously that this forgiveness, though real, was temporary and incomplete. Like every other Old Covenant sacrifice, it depended on the ultimate sacrifice of Christ even for its temporary effectiveness. God could forgive them since He saw Christ through the Old Testament atonement blood. There is a further connection: the specific manner Hebrews 9:23 is phrased makes the "shedding of blood" refer to both the Old and the New Covenant, thus making Christ's work in "heaven itself" a "shedding of blood." This requires us to conclude that, in some manner, Christ's shed blood appears in heaven, which would coincide with Hebrews 9:24's statement that He will "now appear for us in God's presence." Since Hebrews 9:23-24 clearly teaches that some kind of blood sacrifice is occurring presently in heaven, and since such sacrifice would constitute the ongoing work of Christ's eternal priesthood, we are not surprised to see Hebrews 9:23's use of the plural word "sacrifices" in the phrase "with better sacrifices than these" in reference to Christ's present work. Since Hebrews 9:22 introduced "blood" into the text as that which forgives sins, then Hebrews 9:23 would simply mean: "but the heavenly things themselves with better blood sacrifices than these." St. Paul is comparing and contrasting the Old Covenant "blood sacrifices" with the New Covenant "blood sacrifices." What is singular in eternity is plural in time because each Mass presents the sacrifice of Christ, and the Mass is celebrated daily. Finally, the Letter to the Hebrews may not specifically mention a New Testament priesthood, but when you combine this letter with the Institution narratives you basically have the basis for our understanding of the interplay that exists between the work of the High Priest Jesus Christ and the work of the ministerial priest in the Mass. The Church has always turned to this letter to form her conception of the identity and mission of the priest. Since the priest acts in the person of Christ and makes Him present, much of what describes the Jesus in this letter also applies to the priest. Of course, the letter applies to Christ pre-eminently and to the priest only secondarily, or instrumentally. But it still applies. Now, concerning the idea that Calvary is “made present” when a Catholic priest consecrates the bread and wine… not only is this concept utterly ridiculous, it is also blasphemous. No priest can cause a past event to move into the present. And to say, “Well, it is God Who does it, not the priest,” or “It is a mystery,” or “It is done ‘sacramentally’” is just begging the question. There is nothing scriptural about this concept. The event of Calvary is no more “made present” today than the event of the death angel killing the firstborn Egyptian children was “made present” when the Jews would celebrate the Passover. Communion and Passover are reminders pointing to past events. The only way that either one would be “made present” is MENTALLY. After all, the communion service is indeed a MEMORIAL, because Jesus said, “This do in remembrance of Me” (Luke 22:19). That Calvary would be re-presented sacramentally is not begging the question if Jesus Himself told us that this was how it would be made present. When Jesus told the crowd in Jn 6 that they must eat His flesh and drink His blood, most of the crowd walked away because they could not understand how He could be commanding them to resort to cannibalism. 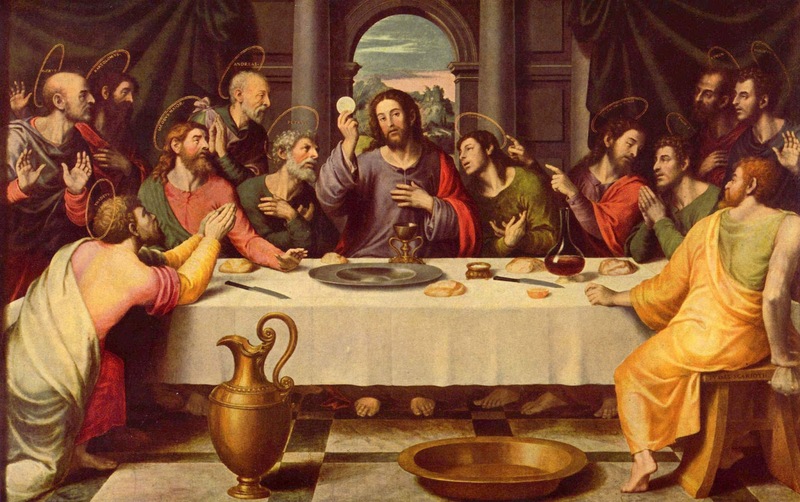 If they would have stuck around, they would have learned from the Apostles how it was to be done, for Jesus showed them at the Last Supper: It would be under the appearance of bread and wine. This Eucharist makes Calvary present by anticipating it. What happens in the Eucharist in an unbloody manner is what takes place on the Cross in a bloody manner: His Body is broken, His Blood is poured out, His Blood is separated from His Body. 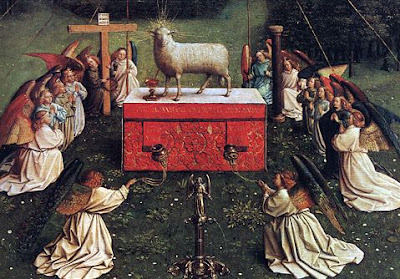 These are all the hallmarks of a sacrifice, and so it follows that whenever this Eucharist is celebrated, this sacrifice is re-presented. Also, I realize that you are content to scoff at how the Jews understood the greatest feast day of their lives, but God Himself set up the Passover meal in such a way that it would actively re-present for every Jew what God did for their ancestors (cf. Exo 12:26-27a; 13:8, 14-15a; Deut 6:20-22). I grant that on the order of substance it was not the same meal, but it was still the closest thing to a sacrament that the Jews possessed. Through active participation in a profound ritual -- through eating the same foods, preparing them in the same way, and reciting the same words -- the Jews made the first Passover present to future generations. God desired that they make it present in this way. There could really be no other way to make it present until Christ came, the one who is Himself a living sacrament. Within the context of a sacrificial meal of re-presentation, He made Himself substantially present and commanded the Apostles to continue to make Him present in the same manner. That is how the Mass is a re-presentation. But, let's step back for a moment. I don't want to get into a debate on the Real Presence of the Eucharist, and I actually don't think it is necessary. By displaying the Body and Blood in a state of separation, the elements display a sacrificial character. This is true regardless of whether Christ is literally present in the sacrament or whether He is only symbolically present. Even if He is only symbolically present, then the Eucharist symbolizes a sacrifice. It is a symbolic sacrifice. Because elders have the duty of performing the sacraments, they have the duty of performing this sacrifice, again indicating the priestly character of their office (cf. Jimmy Akin, "The Office of New Testament Priest"). Nicholas, it seems that you spent a lot of time and energy in the whole first half of Part 3b emphasizing the “sacrificial language” surrounding this issue. But I already addressed that. I acknowledged that Jesus is the High Priest Who offered the perfect sacrifice, so yes, there are sacrificial overtones. And I said that this is all pointing to Jesus’ work at Calvary, not to a ritual (the Eucharist). The symbolism is found in the ritual, but the substance is found at the cross. To say that they are one-and-the-same, is, I believe, more than anyone can prove. The phrase, “This is My body” in no way proves this idea. See the links below. How you could just dismiss all the evidence I provided with a simple wave of your hand is really quite baffling to me. Jesus wasn't simply waxing poetic about His death on the Cross. All of that "sacrificial language" applies to the meal He was celebrating. His command was to do something: Take bread, give thanks, break it, and distribute it ("In the same way also the cup", cf. 1 Cor 11:23-25). It is what we celebrate out of obedience to Christ that bears with it all of this sacrificial meaning! The Institutional Narratives make this clear. In Mt 26:28 and Mk 14:24, we read: "this is my blood of the Covenant which is poured out for many." The Gk word for "which is poured out" is ἐκχυννόμενον, ekchynnomenon. It is a participle in the present tense. The present participle denotes an action in progress or simultaneous with the action of the principal verb (in this case, "is"). These verses would be more literally translated as "which is being poured out", as we find in the Amplified Bible and Young's Literal Translation. What this means is that Jesus was not talking about the future shedding of His bled on the Cross. Instead, He was saying that in the distribution of the wine you have the present shedding of His blood. In other words, the symbolism and the substance is found in the ritual. 19 And he took bread, and when he had given thanks he broke it and gave it to them, saying, “This is my body which is given (διδόμενον, didemenon) for you. Do this in remembrance of me.” 20 And likewise the cup after supper, saying, “This cup which is poured out (ἐκχυννόμενον, ekchynnomenon) for you is the new covenant in my blood. Both Gk words are present participles. Jesus body "is being given", the cup "is being poured" at the time Jesus is speaking these words at the Last Supper. This proves that it is the Eucharist itself that is sacrificial. Claiming that the Eucharist is Calvary “re-presented” because of the sacrificial language is like saying that a wedding album and the wedding it portrays are “one-and-the-same”. There are pictures of people in the album who are dressed for a wedding, there is a wedding cake, there are gifts and celebration involved, there is a bride and a groom making vows, and there are bridesmaids and groomsmen, wedding rings and wedding certificates, etc., etc. So, obviously, this album must be the wedding event itself, right? Since all these things in the album contain “wedding language,” and there are so many “marriage connotations” and references to a wedding, surely this album and the actual wedding event would have to be one-and- the-same, wouldn’t it (according to your logic)? No, you can use all the “marriage language” and “wedding overtones” you want, but this won’t make the wedding album change into the actual wedding event itself. The album simply points back in time to the one-time wedding event. It is the same thing with Christian Communion, i.e., the partaking of the bread and wine. Communion is a ritual (an important and profound one) which points back to the cross, the event of Calvary. They are not one-and-the-same. Communion is a symbol of what happened there. Let’s not confuse the symbols with the substance. I think what you're comparing here is apples and oranges because the Eucharist is a more profound symbol than a wedding album. I agree that the Eucharist points to Calvary. The Catechism affirms the immense sign value of the Eucharist, as you know. But, being a sacrament, the Eucharist points to something that is substantially present. A sacrament is a visible sign of an invisible reality, and the language of the Last Supper reveals that the Eucharist is drawing our minds and hearts to something that is truly present. "Offer this as my memorial sacrifice" ... "My broken body is being given" ... "My blood is being poured out" ... the fact that it is a todah meal within the context of the sacrificial Passover meal -- this is more than artificial flourishing meant to remind us of Calvary. It appears that the Gospel writers have gone to great lengths to show us that the meal itself is a sacrifice. Since I have not made the majority of the claims you are responding to in those posts, I don't really feel the need to address them. I think they would also steer us even further off topic. You did have some points in Part 2 about the Eucharist being a sacrifice, but I have responded to those already. Catholics believe that when Jesus charged the apostles at the Last Supper to "Do this in remembrance of me" (Lk 22:19; 1 Cor 11:24), He charged them with offering the sacrifice of Himself, which essentially made them priests. The English translation of the original Greek does not make this readily apparent. But, a study of the Greek words bears out the sacrificial implications of what Jesus commanded. For example, let us take the Greek word for "Do" in this passage: ποιέω, poieo. If we look at the usage of this word in the Septuagint (the Greek Old Testament), we find that it often occurs within a sacrificial context as the word for the offering in the Temple. The equivalent Hebrew word is עָשָׂה, ‘asah, which the KJV translates as "to offer" 49 times. In the NAS it is even translated as "sacrifice" on two occasions (cf. Exo 10:25; Lev 22:24). Below are just the examples from the Penteteuch. In these examples, the translation of the Hebrew is from the NASB. The translation of the Septuagint is from Brenton's translation. In a few cases I provided the translation from the New English Translation of the Septuagint and/or The Lexham Greek-English Interlinear Septuagint whenever these translations served to further validate the sacrificial meaning of the text. NASB: But Moses said, “You must also let us have sacrifices and burnt offerings, that we may sacrifice them to the Lord our God. Brenton: And Moses said, Nay, but thou shalt give to us whole burnt-offerings and sacrifices, which we will sacrifice (poiesomen) to the Lord our God. NASB: “Now this is what you shall offer on the altar: two one year old lambs each day, continuously. Brenton: And these are the offerings which thou shalt offer (poieseis) upon the altar; two unblemished lambs of a year old daily on the altar continually, a constant offering. NETS: And the second he shall prepare (poiesei) as a whole burnt offering, as is customary. Brenton: And Moses said to Aaron, Draw nigh to the altar, and offer (poieson) thy sin-offering, and thy whole-burnt-offering, and make atonement for thyself, and for thy house; and offer (poieson) the gifts of the people, and make atonement for them, as the Lord commanded Moses. NASB: He also presented the burnt offering and offered it according to the ordinance. Brenton: And he brought the whole-burnt-offering, and offered (epoiesen) it in due form. NASB: "The priest shall next offer the sin offering and make atonement for the one to be cleansed from his uncleanness. NASB: "He shall then offer one of the turtledoves or young pigeons, which are within his means. NASB: and the priest shall offer them, one for a sin offering and the other for a burnt offering So the priest shall make atonement on his behalf before the LORD because of his discharge. Brenton: And the priest shall offer (poiesei) them one for a sin-offering, and the other for a whole-burnt-offering; and the priest shall make atonement for him before the Lord for his issue. Brenton: And the priest shall offer (poiesei) one for a sin-offering, and the other for a whole-burnt-offering, and the priest shall make atonement for her before the Lord for her unclean flux. NASB: "He shall bathe his body with water in a holy place and put on his clothes, and come forth and offer his burnt offering and the burnt offering of the people and make atonement for himself and for the people. Brenton: And he shall bathe his body in water in the holy place, and shall put on his raiment, and shall go out and offer (poiesei) the whole-burnt-offering for himself and the whole-burnt-offering for the people: and shall make atonement for himself and for his house, and for the people, as for the priests. NASB: 'In respect to an ox or a lamb which has an overgrown or stunted member, you may present it for a freewill offering but for a vow it will not be accepted. NETS: And a calf or a sheep that has a cut on its ear or one with a stunted tail, you shall make a slaughtering (sphagia poieseis) of them for yourself, but it will not be accepted for your vow. Brenton: And a calf or a sheep with the ears cut off, or that has lost its tail, thou shalt slay them for thyself; but they shall not be accepted for thy vow. Lexham: But a young bull or sheep with split ears, or docked tail, as slain victims you will offer them for yourself, but for your votive offering they will not be accepted. Brenton: That which has broken testicles, or is crushed or gelt or mutilated, —thou shalt not offer them to the Lord, neither shall ye sacrifice (poiesete) them upon your land. NASB: 'Now on the day when you wave the sheaf, you shall offer a male lamb one year old without defect for a burnt offering to the LORD. Brenton: And ye shall offer (poiesete) on the day on which ye bring the sheaf, a lamb without blemish of a year old for a whole-burnt-offering to the Lord. Brenton: And they shall sacrifice (poiesusin) one kid of the goats for a sin-offering, and two lambs of a year old for a peace-offering, with the loaves of the first-fruits. NASB: 'The priest shall offer one for a sin offering and the other for a burnt offering and make atonement for him concerning his sin because of the dead person. Brenton: And the priest shall bring them before the Lord, and shall offer (poiesei) his sin-offering, and his whole-burnt-offering. Brenton: And he shall offer (poiesei) the ram as a sacrifice of peace-offering to the Lord with the basket of unleavened bread; and the priest shall offer (poiesei) its meat-offering and its drink-offering. NASB: "Now the Levites shall lay their hands on the heads of the bulls; then offer the one for a sin offering and the other for a burnt offering to the LORD, to make atonement for the Levites. Brenton: And the Levites shall lay their hands on the heads of the calves; and thou shalt offer (poiesei) one for a sin-offering, and the other for a whole-burnt-offering to the Lord, to make atonement for them. NASB: then make an offering by fire to the LORD, a burnt offering or a sacrifice to fulfill a special vow, or as a freewill offering or in your appointed times to make a soothing aroma to the LORD, from the herd or from the flock. NASB: and you shall prepare wine for the drink offering one-fourth of a hin, with the burnt offering or for the sacrifice, for each lamb. Brenton: And for a drink-offering ye shall offer (poiesete) the fourth part of a hin on the whole-burnt-offering, or on the meat-offering: for every lamb thou shalt offer (poieseis) so much, as a sacrifice, a smell of sweet savour to the Lord. Brenton: And for a ram, when ye offer (poiete) it as a whole-burnt-offering or as a sacrifice, thou shalt prepare (poieseis) as a meat-offering two tenths of fine flour mingled with oil, the third part of a hin. NASB: 'All who are native shall do these things in this manner in presenting an offering by fire as a soothing aroma to the LORD. Lexham: Every native will sacrifice (poiesei) according to such matters in order to present offerings by fire as a sweet smelling aroma to the Lord. NASB: 'If an alien sojourns with you, or one who may be among you throughout your generations, and he wishes to make an offering by fire as a soothing aroma to the LORD, just as you do so he shall do. Brenton: And if there should be a stranger among you in your land, or one who should be born to you among your generations, and he will offer (poiesei) a sacrifice, a smell of sweet savour to the Lord—as ye do (poieite), so the whole congregation shall offer (poiesei) to the Lord. Lexham: And if an alien among you takes up residence in your land, or a person who may become one among you during your generations and so (he) would (desire) to make an offering by fire, (as) a sweet smelling aroma to the Lord, according to the manner in which you yourselves perform, likewise the congregation will sacrifice to the Lord. Brenton: Thou shalt offer (poieseis) one lamb in the morning, and thou shalt offer (poieseis) the second lamb towards evening. NASB: 'The other lamb you shall offer at twilight; as the grain offering of the morning and as its drink offering you shall offer it, an offering by fire a soothing aroma to the LORD. Brenton: And the second lamb thou shalt offer (poieseis) toward evening; thou shalt offer (poiesete) it according to its meat-offering and according to its drink-offering for a smell of sweet savour to the Lord. Brenton: And he shall offer one kid of the goats for a sin-offering to the Lord; it shall be offered (poiethesetai) beside the continual whole-burnt-offering and its drink-offering. Brenton: Thou shalt offer (poieseis) a tenth for each lamb, for the seven lambs. Brenton: these shall ye thus offer (poiesete) daily for seven days, a gift, a sacrifice for a sweet-smelling savour to the Lord; beside the continual whole-burnt-offering, thou shalt offer (poieseis) its drink-offering. Brenton: ye shall offer to me their meat-offering. They shall be to you unblemished, and ye shall offer (poiesete) their drink-offerings. Brenton: And ye shall offer (poiesete) whole-burnt-offerings for a sweet savour to the Lord, one calf of the herd, one ram, seven lambs of a year old without blemish. NASB: 'You shall present these to the LORD at your appointed times besides your votive offerings and your freewill offerings for your burnt offerings and for your grain offerings and for your drink offerings and for your peace offerings "
Brenton: These sacrifices shall ye offer (poiesete) to the Lord in your feasts, besides your vows; and ye shall offer your free-will-offerings and your whole-burnt-offerings, and your meat-offerings and your drink-offerings, and your peace-offerings. Analysis of the Greek word for "remembrance" (ἀνάμνησις, anamnesis) in the same passage, and the Greek word for "thanks" (εὐχαριστέω, eucharisteo) from all four Institution Narratives (Mt 26:27; Mk 14:23; Lk 22:17, 19; 1 Cor 11:24) reveals the sacrificial nature of what the apostles must "do" as well. For my take on these words, see Part 3b of my debate on the New Testament ministerial priesthood. Kids are actually pretty good at it, if you give them a chance. Does a Catholic have to take active part in the Rosary? Can it be that a rosary is being said and he is not reciting the prayers? I think it depends on why you aren't participating. Some people are intimidated by the rosary, and this is understandable. When you pray it with a group of people, you never know what special prayers are going to be added by the group. If you don't have a rosary with you then you might worry about being able to follow along. You might worry about being asked to lead it. I think if a person is new to the rosary or still trying to get comfortable with it, then it's okay for that person to sit and listen until he is ready to participate. Some people don't participate because they would rather be doing other things. For example, sometimes parents bring their children to a rosary group and the children are there begrudgingly. If they don't want to pray it, I think that's ok. They should definitely respect the other people who are praying by not being a distraction. But, they should not be forced to pray. 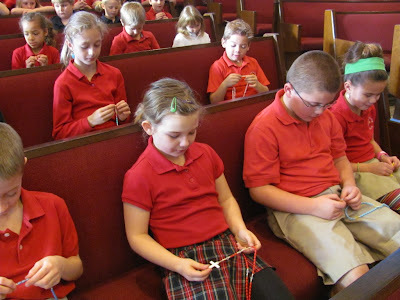 If you force children to pray the rosary then they will only come to resent it. Of course, when a child would rather be doing something else, it is more excusable. We understand that their attention spans are short and they are easily distracted. But, when it is an adult then I think more is required. Married couples confront this. Sometimes, the wife wants to pray with her husband, but he simply doesn't want to. He's not in the mood. He's tired. He'd rather watch what's on TV. In times like this, it's important to buck up and pray anyway. Prayer is always a good thing to do, and always better than what you'd rather be doing. Give it a chance. I don’t know anyone who ever regretted praying. Others are caught not praying the rosary because their mind wondered or they lost their place or got distracted in some way. That's ok, it happens. But, you should fight the temptation to just give up on the rosary the moment you lose your concentration. I think the devil tempts us to abandon prayer by saying, "Oh, you messed up. Looks like you're hosed. Better give it a rest." The best thing to do is to banish that, refocus, and carry on. Finally, some people will sit in on a rosary group but not actively pray the prayers with the group because they use the voices of the group as a way to enter into inner-peace and quiet and bring to God what’s on their heart. I think this is ok too. But, I would also reject the notion that one cannot meditate while he prays the rosary. Once you get really good at it, then it’s possible to pray the prayers and meditate on the mysteries of the rosary at the same time. This is when the rosary really becomes a powerful source of peace and consolation. Why Do Some People Kiss Their Thumb After Making the Sign of the Cross? Is the Divine Mercy Chaplet a Cop-Out? Is the Scapular Just Another Catholic Superstition? What Is the Divine Mercy? How Can We Honor It? This post is the continuation of Part 3 in my debate with Russell on the New Testament ministerial priesthood. You'll want to read Parts 1, 2, and 3a to see where we've been so far. As I said at the end of my last post, I have divided Part 3 into two so that I can spend some time defending the sacrificial nature of the Eucharist without the worry of overwhelming the reader. I have also added headings to this post to help the reader follow along. Let's get right to it! Nicholas, NOWHERE in the book of Hebrews is Calvary shown to be a “perpetual” offering to the Father. There is a subtle twist here by the Catholic Church. But this just seems to be an excuse for the Catholic priest to continue to “offer Jesus” to the Father daily in the Eucharist. But what exactly is this sacrifice? When Jesus told the Apostles at the Last Supper to "Do this in remembrance of me" (Lk 22:19; 1 Cor 11:24), He charged them to make His Body and Blood present to the people. Since in the Eucharistic meal you have Body broken and Blood poured out and Body separate from Blood, you have here a sacrifice. Consequently, the Apostles who make this sacrificial offering become priests. I'd like to flesh this out a bit more (okay, a lot more). Studying the original Greek of the Institution Narratives is crucial to understanding what Jesus did, and what He intended us to do. "Do This in Remembrance of Me"
The Gk. word for "Do" (ποιέω, poieo) in Lk 22:19 (cf. 1 Cor 11:24) is very interesting. For one, it appears in many places in the Septuagint as the word for the sacrificial offering. The equivalent Hebrew word is עָשָׂה, ‘asah, which the KJV translates as "to offer" 49 times. In the NAS it is even translated as "sacrifice" on two occasions (cf. Exo 10:25; Lev 22:24). In English translations of the Septuagint, poieo is often translated as "offer" or "sacrifice". In the Pentateuch alone there are dozens of examples. Brenton's English translation of the Septuagint translates poieo as "sacrifice" in Exo 10:25; Lev 14:19a; 22:24; 23:19; Num 15:8; Deut 12:27. It uses "offer" in Exo 29:38; Lev 9:7, 16; 14:30; 15:15, 30; 16:24; 23:12; Num 6:11a, 16, 17; 8:12; 15:3, 5, 6, 14, 24a; 28:4, 8, 15, 21, 24, 31; 29:2, 39. The Lexham Greek-English Interlinear Septuagint uses "sacrifice" in Num 15:13, 14, 24a. In Lev 22:23, we find the phrase sphagia poieseis, which Brenton simply translates as "slay". Lexham has "as slain victims you will offer". The New English Translation of the Septuagint has "make a slaughtering". Now Jesus, within the context of a sacrificial meal (the Passover), on the night that the lambs were sacrificed (cf. Mk 14:12; Lk 22:7), tells the Apostles, "Do this in remembrance of me". Considering all of this, one could just as easily translate this command as "Offer this in remembrance of me", in which case the sacrificial meaning of Jesus' words is more readily apparent. It is also worth nothing that in Lk 22:19 (cf. 1 Cor 11:24) poieo is in the present tense. The present tense usually denotes a continuous kind of action. It can also be used to describe something some one does habitually. Robertson's Word Pictures of the New Testament says that "This do" (τουτο ποιειτε) indicates repetition, as if Jesus said, "keep on doing this." Psa 37:1 A Psalm. Pertaining to David. As a reminder (anamnesin). Psa 69:1 Regarding completion. Pertaining to David. As a reminder (anamnesin), for the Lord to save me. Lev 24:7 You shall put on the pile pure frankincense and salt, and they shall be as loaves for remembrance (anamnesin), set before the Lord. Num 10:10 And in the days of your gladness and at your feasts and at your new moons, you shall trumpet with the trumpets over the whole burnt offerings and over your sacrifices of deliverance, and it shall be for you a reminder (anamnesis) before your God. I am the Lord your God. Heb 10:3 But in these sacrifices there is a reminder (anamnesis) of sin year after year. At first, Psalms 37 and 69 don't appear to provide this sacrificial context. But, in these psalms the equivalent Hebrew word (זכר, zkr) is usually translated as "memorial offering." Psalm 69 is even a todah psalm (more on that later). As for Lev 24:7, the Hebrew word is אַזְכָּרָה, azkarah which is usually translated as "memorial portion" or "token offering" (cf. Lev 2:2, 9, 16; 5:12; 6:15; Num 5:26). In Num 10:10, the Hebrew word is לְזִכָּרֹון֙, zikkaron which means "memorial, remembrance." אַזְכָּרָה f., a verbal noun of the conj. Hiphil, from the root זָכַר, in the signification of sacrificing, Isa. 66:3; properly a memorial (offering), that which calls to memory. "According to the law of the test of adultery in Numbers 5:11-31, the purpose of the 'memorial (portion)' (see v. 26 there) seems to have been to call to mind the reason for the offering in the presence of the Lord. The term itself is directly related to the Hebrew verb meaning 'to remember'". The Gk word anamnesis was chosen by the translators of the Septuagint to communicate this meaning. It is the word for the memorial offering, the memorial portion, the sacrifice that brought the people into the remembrance of God. We find it now in Luke and Paul's accounts of the Institution Narrative. It appears from all this that "Do this in memory of me" could also be translated as "Offer this as my memorial sacrifice". Now, the sacrificial meaning of the Eucharist is unmistakable. The Eucharist is a memorial sacrifice because, in it, God remembers His people and the sacrifice that Christ offered to save them -- and we remember all that the Savior has done for us. anámnēsis means “remembrance” or “recollection.” In Heb. the sin offerings cannot remove sins but remind us of them (cf. Num. 5:15). In 1 Cor. 11:24 Christians are to enact the Lord’s Supper in a recollection of Jesus which has the form of active re-presentation as the action of Jesus and the disciples is repeated. Notice the pronouns. The Passover is not about what God did for my ancestors a long time ago, it's about what He did for me. Jesus, in the Last Supper, transformed the Passover meal so that it is no longer a "memorial forever" and a re-presentation of the first Exodus but instead a "memorial forever" and a re-presentation of the New Exodus, in which Jesus Himself conquers slavery and death with His own Passion, Death, and Resurrection. Now, whenever the Eucharist is celebrated, it is the salvific work of Christ that is made present. The Eucharist is the new memorial offering, the new Passover meal. Jeremy Drisoll, "The Word of God in the Liturgy of the New Covenant" (see "Between Remembrance and Invocation", pg. 92-96). "When He Had Given Thanks"
The last indication that Jesus instituted a sacrificial meal is in the word for "thanks", εὐχαριστέω, eucharisteo. This word also helps us to understand why the sacrifice of Christ is offered continually. Lev 7:12-15 If he offers it for a thanksgiving, then he shall offer with the thank offering unleavened cakes mixed with oil, unleavened wafers spread with oil, and cakes of fine flour well mixed with oil. 13 With the sacrifice of his peace offerings for thanksgiving he shall bring his offering with cakes of leavened bread. 14 And of such he shall offer one cake from each offering, as an offering to the Lord; it shall belong to the priest who throws the blood of the peace offerings. 15 And the flesh of the sacrifice of his peace offerings for thanksgiving shall be eaten on the day of his offering; he shall not leave any of it until the morning. A todah sacrifice would be offered by someone whose life had been delivered from great peril, such as disease or the sword. The redeemed person would show his gratitude to God by gathering his closest friends and family for a todah sacrificial meal. The lamb would be sacrificed in the Temple and the bread for the meal would be consecrated the moment the lamb was sacrificed. The bread and meat, along with wine, would constitute the elements of the sacred todah meal, which would be accompanied by prayers and songs of thanksgiving, such as Psalm 116. At the todah celebration that brought the ark into Jerusalem, David gave the Levites a new mandate — their primary job was to "invoke, to thank, and to praise the Lord" (1 Chron. 16:4). The Hebrew word for "invoke" is zakar, which literally means to remember — the noun form signifying "memorial" (zikkaron). One of the most important purposes of a todah meal was to remember the saving deeds of the Lord. Indeed, this is one of the functions of the todah psalms: to recount the mighty deeds of God (cf. Ps. 22:28). We are also informed that "on that day David first appointed that thanksgiving [todah] be sung to the Lord by Asaph and his brethren" (1 Chron. 16:7). The Levites were to give thanks and praise to God "continually" (1 Chron. 16:37, 40). This perpetual adoration was to characterize the Temple liturgy as a todah liturgy — a liturgy of thanksgiving. We know that the Last Supper is a todah sacrificial meal because it has the same characteristics as the todah meals celebrated in the Old Testament. The Passover meal is essentially a corporate todah meal. In both there is the sacrificial lamb, unleavened bread, wine, the singing of psalms (the Hallel psalms that are sung during the Passover meal are also todah psalms), and perhaps most importantly, sentiments of thanksgiving and remembrance. Psa 50:12-14 “If I were hungry, I would not tell you; for the world and all that is in it is mine. 13 Do I eat the flesh of bulls, or drink the blood of goats? 14 Offer to God a sacrifice of thanksgiving, and pay your vows to the Most High"
We see from all this that the Eucharist is that todah sacrificial meal that is offered continually. It has replaced the animal sacrifices and is the only sacrifice that remains. Dr. Tim Gray, "From Jewish Passover to Christian Eucharist: The Story of the Todah"
Stephen Pimentel, "The Todah Sacrifice as Pattern for the Eucharist"
To summarize, in the "doing", the "remembrance", and the "giving thanks" we find crucial indications of the sacrificial and perpetual nature of the meal that Jesus Christ instituted at the Last Supper. But it can’t work that way. Jesus is not mankind’s offering to God. MAN does not (and cannot) offer Jesus as a sacrifice. No, the Bible says that only JESUS (the Perfect High Priest) did the offering, and He offered HIMSELF (Hebrews 7:27; 9:25). Again, He did His OWN offering, and He did it ONCE. So this is not a continual / daily offering to God. It was offered to the Father once, for all. There is really no question in my mind that Jesus commanded the Church to offer His Body and Blood as a memorial sacrifice. As Lk 22:19 and 1 Cor 11:24 reveal, it does work that way. Now, a question does remain as to how it could be both our offering and Jesus' offering. This is a question worth answering. Of course, these points require some elaboration. Regarding the first sense, we're talking about the apostles working in persona Christi, in the person of Christ. Long before the Last Supper, Jesus told them, "Whoever hears you hears me, whoever rejects you rejects me" (Lk 10:16). He gave them authority and power to participate in His own divine prerogatives, such as forgiving sin (cf. Jn 20:21-23; Jas 5:14-15) and saving people (cf. Acts 11:13-14; Rom 11:13-14; 1 Cor 9:22; 10:33; 1 Thes 2:16; 1 Tim 4:16; 2 Tim 2:10). Just as Paul forgave sins "in the person of Christ" (2 Cor 2:10; KJV, Darby, Douay-Rheims, Knox, Wycliffe, YLT, Vulgate), so does the priest offer the Sacrifice of the Mass. It is in His person, as if Christ Himself were there doing it. If the apostles can forgive people and save people without treading upon the prerogatives of Christ, then so too can they offer His sacrifice without competing with Him. Regarding the second sense, we actually see this in the Letter to the Hebrews, where it says that we should go forth to meet Him outside the camp, bearing our abuses, and offer our sacrifice of praise and our good works of love (cf. Heb 13:13-16). The Eucharist, by re-presenting the sacrifice of Calvary, makes it possible for us to meet Him outside the camp. Once there, we are able to suffer with Him and unite ourselves with Him. Uniting our suffering with the suffering of Christ is a very scriptural notion. I don't really know what else is meant by "taking up your Cross daily" to follow Christ (Lk 9:23). Paul spoke of "sharing abundantly in Christ's sufferings" (2 Cor 1:5), "becoming like Him in His death" (Phil 3:10), even "completing what is lacking in Christ's afflictions" (Col 1:24). Peter too spoke of "sharing Christ's sufferings" (1 Pet 4:13) and following in His steps by suffering wrongs patiently (cf. 1 Pet 2:20-21). In the Mass, we "present our bodies as a living sacrifice" (Rom 21:1), we offer our gifts as a pleasing aroma (cf. Phil 4:8), we "offer spiritual sacrifices acceptable to God through Jesus Christ" (1 Pet 2:5). We offer everything we are and thereby join ourselves to His offering. In this way the offering of Christ becomes the offering of the whole Church, which is His Mystical Body. Just as the Passover meal was a corporate todah, a thank offering by all of Israel, so is the Eucharist (the new Passover) a thank offering by the Church (the New Israel). Although the benefits of this offering are offered continuously to MAN, it will never again be a sacrificial offering TO THE FATHER. According to Scripture, we get the benefits of Calvary through believing in His work there, not by “re-presenting” it to God. Faith is a very important prerequisite for receiving the Eucharist, so I see nothing contradictory in affirming both statements. Catholics are confusing His perpetual intercession with His one-time, past-event, offering. You are confusing what "once for all" means. This does not mean that Jesus' offering of Himself is over and done with. Instead it means that it is never-ending. Let me be clear. He suffered once and He died once. Never again will He suffer or die. But, this one act of suffering and dying is perpetually offered to the Father, so that the Father always has reason to save us from our sin. I firmly believe that a careful reading of Scripture bears this out. Consider the purpose of the high priest. He is to "make expiation for the sins of the people" (Heb 2:17), to "act on behalf of men in relation to God, to offer gifts and sacrifices for sins" (Heb 5:1). Jesus is our High Priest. Now, the question arises: Did Jesus set down his priesthood once He died on the Cross and rose from the dead? Was that the end of His priestly ministry? No. Heb 7:24-25 but he holds his priesthood permanently, because he continues for ever. 25 Consequently he is able for all time to save those who draw near to God through him, since he always lives to make intercession for them. 25 Nor was it to offer himself repeatedly, as the high priest enters the Holy Place yearly with blood not his own; 26 for then he would have had to suffer repeatedly since the foundation of the world. But as it is, he has appeared once for all at the end of the age to put away sin by the sacrifice of himself. The text does not state that Christ will not need to re-present His sacrifice before God. It states that Christ's "once-for-all" offering will not be like the offering of the Old Covenant priests who had to go in and out of the Most Holy Place every year. When Christ enters the Most Holy Place He is there to stay. He does not have to go in and out, which would require his suffering and death each time He re-entered. Rather, He enters once, never to leave again. Once, and for all time. Heb 8:1-3 (Knox) And here we come to the very pith of our argument. This high priest of ours is one who has taken his seat in heaven, on the right hand of that throne where God sits in majesty, 2 ministering, now, in the sanctuary, in that true tabernacle which the Lord, not man, has set up. 3 After all, if it is the very function of a priest to offer gift and sacrifice, he too must needs have an offering to make. Heb 9:24 For Christ has entered, not into a sanctuary made with hands, a copy of the true one, but into heaven itself, now to appear in the presence of God on our behalf. Rom 8:34 Is it Christ Jesus, who died, yes, who was raised from the dead, who is at the right hand of God, who indeed intercedes for us? That is what is meant by "once for all". The very phrase you have been using to refute my argument actually confirms it! To CONTINUE with any kind of sacrifice that supposedly atones for sin is to say that Jesus’ suffering on the cross was JUST NOT ENOUGH. This assumes that the Sacrifice of the Mass and the sacrifice of Christ are separate sacrifices. But, they are not. They are one and the same sacrifice. It is interesting that out of all the New Testament books, the book of Hebrews has the most to say about the priesthood AND about sacrifices, yet it never mentions an office of ministerial priests for the church today, nor does it mention the Catholic Eucharist. Strange indeed. Instead, it tells us that God is pleased today with sacrifices like “doing good,” “sharing” and “praise.” THESE are the types of sacrifices that we offer today (under the New Covenant). But why not even mention the Eucharist if THAT is the most pleasing and most important sacrifice? I have already shown how, by saying, "Do this in memory of me", Jesus commanded the continual sacrificial offering of Himself by the apostles, and that He made them priests once He gave them a sacrifice to offer. What the Letter to the Hebrews does is to orient this offering and this priesthood within the priesthood of Christ. In this way it has everything to do with what I have been defending. Nicholas, I’m sorry, but with all due respect, the verses above that you provided did nothing to prove your case. The Bible (especially in Hebrews) strongly demonstrates that the sacrifice for sin does NOT remain, therefore, neither does the (ministerial) priesthood. I am interested to see how you will continue to claim this, in light of the new evidence that I have provided. You also mentioned Jude 1:11 and made much of Korah’s rebellion towards authority. Yes, Korah was certainly wrong in what he did, but this is NOT an appeal by Jude to go back to a ministeral-type priesthood. He was simply warning us of rebelling against legitimate and God-ordained authority. But Jude is not the one really dealing with the “priesthood” and “sacrifices.” The book of Hebrews does. No matter how you try to spin it, Jude 1:11 is about priesthood. Like I said in Part 2, "The way of Cain", "Balaam's error", "Korah's rebellion", all three of these refer to priestly service. Cain offered a sacrifice to God that was displeasing to Him (cf. Heb 11:4). Three times Balaam set up altars with which to offer a sacrifice of cursing upon Israel (cf. Num 23). And Korah's rebellion was against the priesthood of Moses and Aaron. Moses even settles the dispute by having Aaron and Korah both light incense to the Lord, which is a function strictly of the ministerial priesthood. "Do this: take censers, Korah and all his company; put fire in them and put incense upon them before the Lord tomorrow, and the man whom the Lord chooses shall be the holy one. You have gone too far, sons of Levi!” (Num 16:6-7). Moses is basically saying, "You want to usurp the priesthood of Aaron? Let's see who's offering the Lord will glorify." Korah's rebellion is in every way against the ministerial priesthood of God, and the only way for people in the New Testament Church to perish in this rebellion is for them to rebel against the ministerial priesthood of God as well. You implied that some are guilty of usurping the priesthood. But anyone, Catholic or otherwise, who claims to be offering a sacrifice to God that atones for sin is indeed usurping the High Priest’s office. And, in my opinion, this person / group would be just as guilty (or even more so) as Korah. For one, this passage is obviously not about Jesus' priesthood. The sinners in question in this letter deny Jesus by their licentiousness (vs. 4), not by trying to become high priests. They "reject authority" (vs. 8), that is, of the apostles (vs. 3, 17) as many sinners did (cf. 2 Tim 4:14; 2 Pet 2:10; 3 Jn 1:9). The flock of God is the charge of the presbyteros (1 Pet 5:1), and you know who I think they are. Secondly, ministerial priests do not usurp the High Priest anymore than shepherds usurp the Chief Shepherd (cf. 1 Pet 5:1-4). They are His instruments, just as Paul was the instrument of Christ (cf. Acts 9:15). They act in His person, as Paul did (cf. 2 Cor 2:10). 1) Only the Perfect High Priest (Jesus Christ, Himself) could offer this sacrifice (Hebrews 7:26-27; 9:7, 11-12) – Mere man could not (and still cannot) offer it. 2) There was only ONE offering of this sacrifice (Hebrews 9:28; 10:14) – It was a one-time deal, and it was at Calvary! There is no “re-presenting” of this offering to God. Why would there be a need to “re-present” the payment for a debt that has already been paid? In a nutshell, the concept of the Catholic Eucharist and a New Testament ministerial priesthood is not biblical, and it actually perverts and minimizes the work of Jesus Christ, the Messiah, on Calvary. You still have a long way to go to convince me of that. I do pray that Catholics will come to see this truth. And I hope that no one will see my comments as spoken in the spirit of bitterness or hatred. They certainly are not. I’m saying these things out of love for Catholics. I used to be one. That is likewise my prayer, out of love for former Catholics. John S. Martignoni, Is the Mass a Sacrifice? PS: From here you may proceed to Part 4. Have a question about Catholicism or a message for me? Fire away! Provide your email address if you want me to respond to you privately. Enter the text from the image above into the space below and then press the "Send" button. 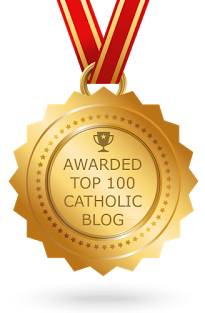 To read my answer to your question and previous questions, see the Catholic Q-A Series blog label. Baptism: Empty Ritual or Saving Power? Is Masturbation a Mortal Sin? Where is the Sacrament of Confirmation in the Bible? Why Do We Have the Penitential Rite at Mass? Saint Michael the Archangel, defend us in battle. Be our protection against the wickedness and snares of the devil. May God rebuke him, we humbly pray; and do Thou, O Prince of Heavenly Host - by the Power of God - cast into hell, satan and all evil spirits, who prowl about the world seeking the ruin of souls. Amen. All opinions expressed herein are mine and do not necessarily reflect the opinions of my employer or anyone else.